Hey, Amy. Just checking in to see how things are going in 1960-something. You're hitchhiking west to the province of Alberta now? And you found a lost cat wandering along the highway? ... although it's true that black cats are abandoned far too often. We've all heard the superstition that a black cat crossing one's path is bad luck. But the bad luck actually comes to the cat itself. A stigma is attached to black cats in western society, but the folklore surrounding black cats varies from culture to culture. In the United Kingdom, for instance, a black cat crossing someone's path is considered good luck. 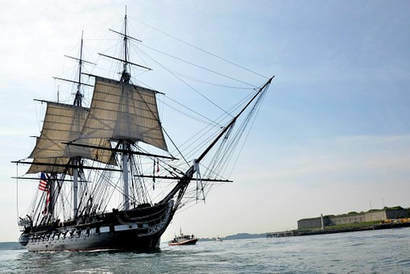 Supernatural powers attributed to black cats were welcomed by sailors on ships. Black cats were considered good omens, and were viewed in a positive light. They were sought after to join the crew. But today in modern times, black cats have fewer rates of adoption in shelters compared to other colours of cats. There have been many myths regarding the negativity surrounding black cats. Centuries ago, they were thought to be companions to witches and sorcery. Some believed black cats were human witches in disguise. 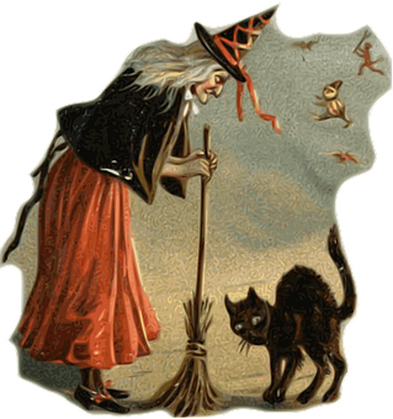 Others believed that witches could be reincarnated back to life in the form of a black cat. 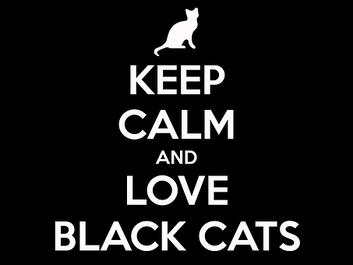 In the 1920s the black cat was adopted as a Wiccan (witches) symbol. The commercial association between Halloween and black cats has been detrimental to the cats themselves. Shelters often delay the adoption of black cats until well after Halloween, fearing for their safety. ... as friendly and loving as cats in any other colour. I know you'll treat this cat well, Amy. And please make sure it's safe with you this Halloween. It's normal in 1960-something for cat owners to let their cats roam around outside. But it would be a good idea to keep your black cat inside on All Hallow's Eve. Hey! Maybe you could go dressed up as a nerd on Halloween. It's so different than a hippie. But then again, the word "nerd" in the early 1960s is only now coming to light as meaning a bookish type of person, or one who is extremely interested in one subject, like computers for instance (although of course computers don't exist yet where you are). The first use of the word "nerd" was in a book called IF I Ran The Zoo ... written by Dr. Seuss. Yes, let's nix that idea. Maybe going as a nerd isn't a great suggestion, Amy. Everyone would think you're a librarian. A-huh, that's one of the limited professions commonly available to young women in the 1960s.